Located on the 81st floor of Seoul’s new landmark Lotte World Tower Signiel Hotel Seoul, Michelin one-starred Bicena is the highest situated Korean restaurant in the city. For most restaurateurs, moving locations soon after winning the coveted Michelin star would be a challenge that they would rather avoid. Lucia Cho, 35, CEO of Bicena and the Michelin three-starred Gaon, however, embraced the challenge with open arms. “It presented a new opportunity for us,” Cho said about the decision to move the casual modern fine dining Korean restaurant from its Hannam-dong location. “Bicena’s renewal has renewed my passion for food, (and the) menu,” said Cho. Open for about three weeks now, the newly minted restaurant offers a stunning vista of the southern part of Seoul and all the tables take advantage of it. In fact, sitting through a lunch there, I noticed small planes flying by, headed for the nearby Seoul Air Base. It was a novel experience dining among the clouds with giant birds gliding by. As we were about to start the interview on April 21, Cho introduced me to an author she was seeing off. She had just had lunch with the author and her Tarot-card reading husband. She had invited the couple to lunch after seeing them on a morning TV show. “She is someone I would like to be friends with,” Cho said. “I need to be a fighter. Perhaps she can give me the energy,” she said. Indeed, running two fine dining Korean restaurants in a city notorious for its highly competitive restaurant scene requires a lot of energy. She admits to suffering from insomnia, but it is not over business worries that she is losing sleep. She said she has an insatiable curiosity that keeps her up at nights, glued to her smartphone. 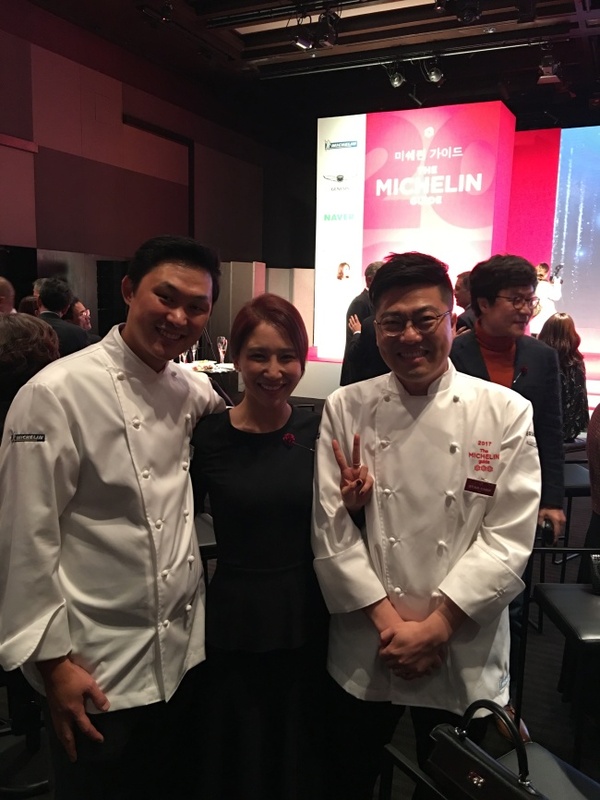 From left: Bicena executive chef Bang Ki-su, Lucia Cho, and Gaon executive chef Kim Byeong-jin pose for a photograph at the Michelin awards ceremony in Seoul last year. “I have a mobile addiction. I have so many things I am curious about,” she said, explaining how smartphones allow you to get answers to your burning questions in a matter of seconds. It would be tempting to credit Cho’s phenomenal success to her father Cho Tae-kwon, KwangJuYo chairman, a visionary who pioneered fine dining hansik on a global scale. A man clearly ahead of his time, his original Gaon shut down a few years after it boldly announced the arrival of high-end hansik. However, having watched Cho since the time when she, along with her father, hosted private dinners at their home in Seongbuk-dong, which served as practice run for the restaurants that were to follow, such dismissal of the younger Cho’s efforts seem unfair. “I wanted to be a chef. I wasn’t happy at the company,” Cho said of her two years at KwangJuYo where she worked marketing high-end ceramic dinnerware. “My dream was to be a Martha Stewart,” she said with a laugh. “I know it was very ambitious. But I thought it would be very cool,” she said. Her opportunity came in the form of her father’s 2012 volume on Korean cuisine and culture in which he expounded his vision for Korean cuisine, its development and globalization. “I argued with my father about his writing. I told him ‘Why don’t you just open a restaurant,’” she said. “And he challenged me to do it,” she said. It was a challenge that she gladly took on. “He (my father) only came to the restaurant after the opening, although he was involved in taste testing,” she said. What Cho describes as a “passion of youth,” Bicena opened its doors in 2012 and it soon became a hit with trendsetters and foreign visitors. “Sipjangsaeng,” or the myth of 10 creatures with long lives, form the foundation of the new Bicena menu. As reflected in the theme, the focus is on healthy eating. Bicena is not a traditional hansik restaurant that plies you with dish after dish. The individual portions, served in dinnerware specifically designed for each dish, are small and sauces are given a light touch. “We want to discover hyangto, or regional cuisine. By hyangto, I mean food that is in the process of being forgotten. It is humble, simple food for every day,” Cho said. “In my meetings with chefs, I ask them to be inspired by the actor Choi Bul-am. You know he has a TV show where he travels to all corners of Korea for regional food or delicacies,” she said. With four Michelin stars under her belt, Cho is more energized, more confident about her vision. “Customer need to come first. They are not just an audience. I think of the guest as someone who can give me the best feedback,” she said. Running a restaurant is a full-time commitment and when you are responsible for two restaurants with four Michelin stars between them, things can seem overwhelming. “Sometimes I feel exploited by my father,” Cho said about her very strong-willed father, a source of inspiration and encouragement as well as the harshest critic. Yet, she accepts this is how things are for now. “He says he feels bad. He wishes a perfect guy for me, that the company won’t need me. But right now, he needs a lot of help,” said Cho.